An artist’s impression of how Liverpool Sound City 2015 will look when the festival moves to the Docks. 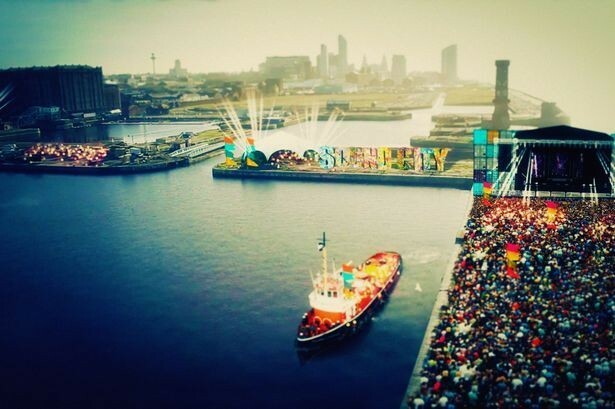 Liverpool Sound City’s move to the Docks maybe a sink or swim situation, however, Getintothis’ Beth Parker insists, that despite the obvious drawbacks it’s a sea change which is needed. Today’s announcement that Liverpool Sound City is set to move from city centre venues to the warehouses of Bramley Moore Dock is sure to ruffle a few feathers. However, with last year’s issue surrounding venue capacity and queues, could this move be the making of the North West’s favourite festival? Since 2007, Sound City has gone from strength to strength. With each year, it’s had bigger bands, increased its venue use, had mass ticket sales and received national media coverage, all the while we’ve been having more fun. As city residents, for years, there’s been nothing better than booking the Friday and Monday off work and waiting for that May weekend to come so you can run about the city centre, clocking up a decent tally of bands and venues over the three evenings, before passing out on Sunday, knackered but happy. And it’s for this reason that many may, upon first hearing, disapprove of the festival organisers’ decision to take Sound City away from our beloved venues to a site outside of the immediate city centre area. It goes without saying that, apart from seeing some of your favourite bands, part of the fun and excitement of Sound City has lay in the fact that you have to run around from venue to venue like a headless chicken trying to make it in time for the next act. One minute you’d be in the Anglican Cathedral and the next you’re having to leg it down to The Zanzibar to make it in time for another gig. Hand in hand with this, Sound City’s ever-increasing venue use over the years, also forced city regulars to try out new venues. It made us step out of the comfort of our regular haunts and try those venues which we’d forgotten about or would usually discount. The festival even set up new venues and stages in the city specifically for the May weekend, such as the Garage and Moon Museum, which were always a novelty for festival goers. Undoubtedly, it is this actual physical experience which the festival offered that will sorely be missed. Alongside this, is the fact that taking the festival away from city centre sites takes business away from independent city centre venues. And this is not only from the bars and music venues where gigs are usually held but from city centre hotels and shops which gained footfall over the three days. Now, we all know that Liverpool is a small place and the fact Sound City is to move down to the docks is unlikely to stop people from taking a jaunt up to the main city area, however, the long-time venues of the festival will undoubtedly lose out on trade and profit which are usually made over the festival weekend. With this is the worry of the cost of drinks and food in the new festival area itself – will a one site location mean the usual rip off festival prices, bag searches, heavy-handed security and strict policies about bringing your own ale into the festival site? Last year, it was clear that the festival had, in some ways, become a victim of its own success. While it was undoubtedly boss to see more people attend Sound City than ever before, it was definitely not so boss to have to queue to get in to Wolstenholme Square, or to receive a text from your mate to tell you they couldn’t get in to a gig. Worse still was having to endure a queue to enter the square and find the venue you were entering was near-empty. What’s more, with this there was also a definite noticeable increase in the number of railings used to section queues off and people in high vis telling us how to queue. And while we understand why this was necessary it wasn’t a highlight of Sound City 2014. So with this fresh in mind, it does seem only natural that the festival move to a site where it can, once again, have the freedom to work in its own right, away from city centre constraints and laws. At the moment, the site of Bramley Moore Docks is not in use by any other organisation or city centre venue, which will enable Sound City to make the site its own. Moreover, a bigger space, with larger capacity simply means bigger bands, just like Belle and Sebastian. We all know how annoying it’s been over the years to have had some decent bands turn down the chance to play in the city because they’ve believed our venues haven’t been big enough, so perhaps this new Sound City location could be the opportunity to get bands of this mind set to play in Liverpool again. The centralised hub should also negate poor sound issues which have undermined certain venues of the festival throughout it’s existence. No one wants to see a repeat of The Bug‘s lambasting from last year. Furthermore, as Sound City CEO Dave Pichilingi states the fact that the new site will be built upon and around the water front itself opens the festival up to some interesting, creative ideas. A quick Google of what’s going on around the city on the weekend of Sound City 2015 shows what an animated place the docks will be on at the time. Monday May 25, the day following the festival, will see the meeting of the Cunard Line’s Three Queens, when the Queen Mary 2, Queen Elizabeth and Queen Victoria ships will meet on the Liverpool waterfront to celebrate its 175th anniversary in a one off event. 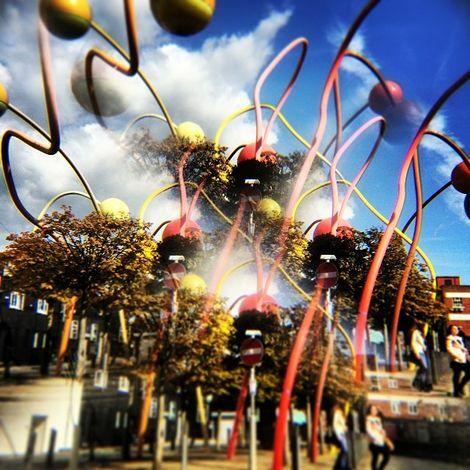 Without a doubt, the dockland area is sure to be a buzz of excitement and people, which could be something that the festival could capitalise on. And in reality, how peeved off can we really be at a festival we love which goes on to further success? While it is a shame that it can’t stay within its usual city centre setting the move of Sound City to the docks is only a measure of its achievements and this is something we should all be happy about. Furthermore, it is also good to see that organisers have listened to the festival goers’ feedback from last year and have tried to come up with an answer to the madness which ensued. After all, we’d rather have a venue we can get in to over hearing the muffled sound of bands through a brick wall any day… Perhaps it really is time for a change.